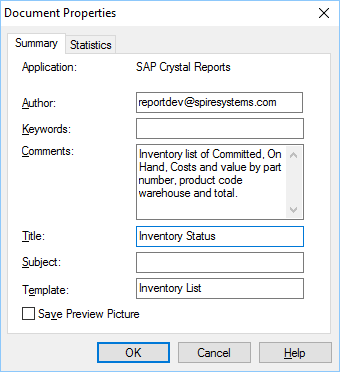 Spire uses Crystal Reports for all of its reports. Spire partners can assist with developing reports for you or if you have the knowledge you can write them on your own. The reports are created or edited with Crystal Reports versions 10, XI or 2013. Crystal Reports can be obtained online from SAP with this link. If you have a previous version of Crystal Reports then you may qualify for an upgrade price. Author – The person that developed this report. Comments – A brief description of what this report does. This is shown to the user when they print it in Spire. Title – This is the title that the user sees when they print the report in Spire. Template – The template name is how Spire knows where the report should be presented to the user. See ‘Report Templates’ for more detail.